"P" is hard for Arabic speakers to say so they say "b". Constitutional monarchy. Senators appointed by the king. Lower house has 7 women. Women required by quota in the '80's. Lower house elected by the people. 5% Christian and 85% of those 5% are Greek Orthodox. Discrimination not allowed. Guide's father married Islamic & Jewish women so his family is Jewish. Circassians from Russia. All inter-married. 6th Century AD started Christ. 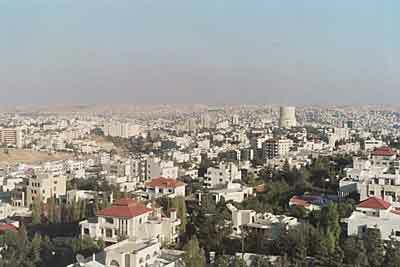 Conversion to Islam after 6th c.
Amman is the capital. Came from Ammonites who lived there, now called Amorite. 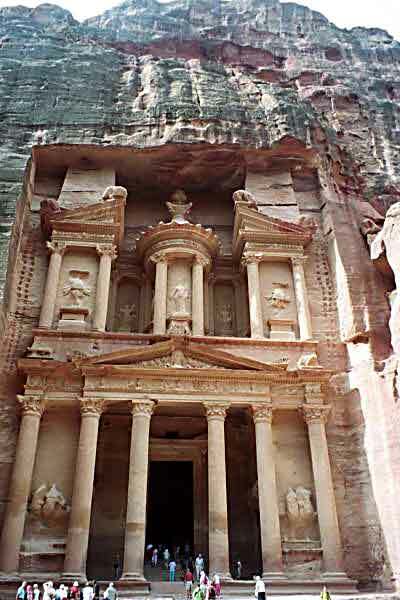 Petra was one of 4 Canaanite kingdoms, the Edomites from the Book of Numbers, Chapters 21-23. Iraq was Palestine = Amorite. Abraham was Amorite. Abraham was the first to believe in 1 God 2000 BC. Elina Captolina=Roman. First name was hor (city) + salem (peace) so city of Salem or city of peace. 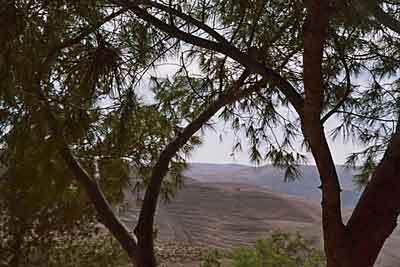 Settled in Jerusalem although desert because allowed to believe in one God & not idols. City of Madoba: St. Georgio's Church to see mosaics in church; 50/50 Islam & Christian. 6th C-Ottomans allowed only re-use of existing church. Christians arrived from Karnak & found this church and could rebuilt it in 1880AD. Built by 1900 (completed) & now a Gk. Orthodox church. Education: public ($30/year) and private. Mosaic by Sulimanos (Greek ending). 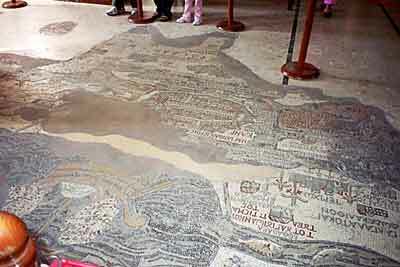 6th century AD; 11,000 hours of work to show pilgrims what to see in the Christian area of Jerusalem to Turkey & Egypt. Greek writing because that was the official church language then. Map shows Jerusalem, Damascus, Roman Camp where it's believed J.C. was crucified. 12 spots of Israelites,. 99 names & camel only knows the 1 secret actual name of God. 18+81=99: lines of the hand show these numbers=the name of God. Michael = place of God. Muslim belief is God is always with you watching. Mosque is only for community relations. Ishmael=oldest & best son of Abraham. So OK for his father to kill him for the God who rescinds the order of Abraham to kill Ishmael at the last minute since they proved their faith. Matoba (Medova in the Bible)=fruit juice springs originally. Matoba now means table filled with food. Best wine. 726 AD monks felt sorry to destroy the floor tiles so paved over it; Greek language of inscriptions because Greek was official language. Represents types of society of the 6th century in this area: slaves, traders, monks, pilgrims, fighters. 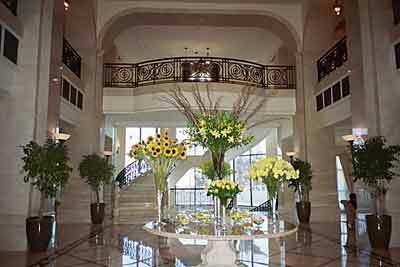 Fertile soil but not water. Poor get water once a month from water tanks. Israel prevents access to water. Illiteracy less than 10% mostly Bedouin women. 1.5 million students out of a total pop. of 5 million. Under water up till 45 million years. 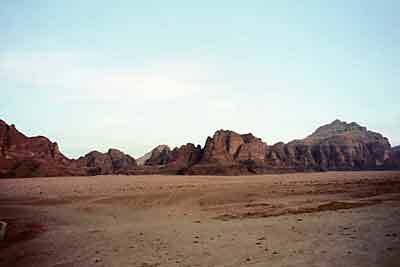 Wadi Rum = major road stop for incense. 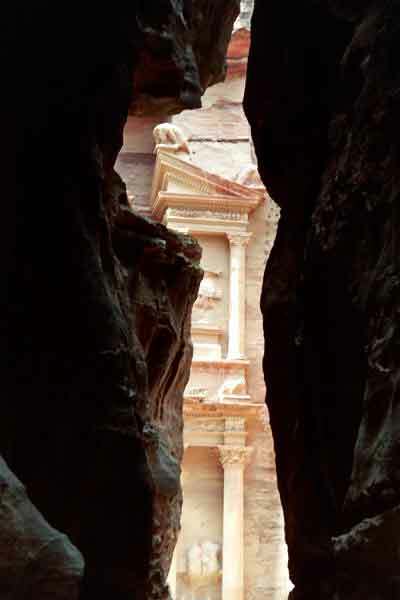 Petra was on the silk road. Wadi Run on incense road. Asian plates connect with African. Jordan begins at edge of Asian plate & Egypt at end of African plate. They had triad-based religion also. Water system formed by shift in tectonic plates & they refined it. 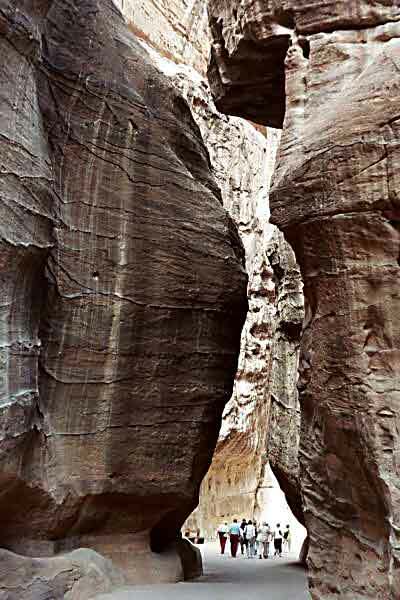 Source of water was actually outside Petra but their enemies thought it was inside. Carefully kept secret! Greek & Roman visitors left graffiti. 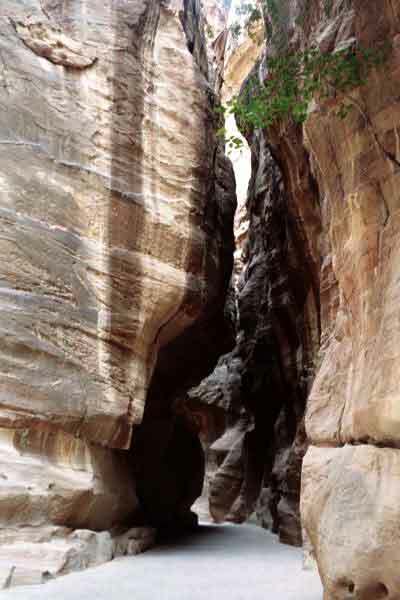 Nabateans were from Yemen or Bahrain and skilled in water management. Pre-Nabateans were Edomites. 8th c AD Edomites were shepherd. 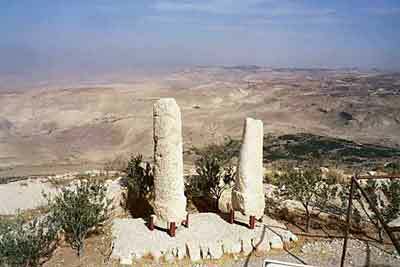 They chose the location because it was well-fortified & fertile & on pilgrimage routes. Nabateans took over Edomites. Connected to other civilizations. The famous Cleopatra was the 7th Cleopatra out of 14. Cleopatra asked for tax from the Nabateans. They were angry. 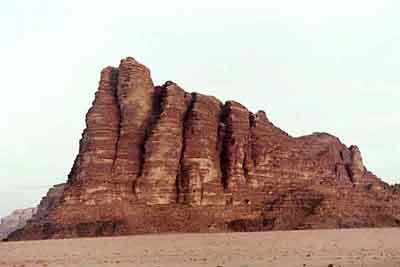 Nabateans burned her army. Marc Antony lost that fight. Herodotus promised Salome _ the kingdom but she asked for the head of St. John the Baptist instead. Herodotus' first wife was the daughter of King Aritus who was King of Nabateans. 62 BC Romans came. Herodotus asked for Roman support. King Arites withdrew from Roman's 4,000 troops. Then the Greeks tried to enter the Nabatean's city during a feast to steal their treasure. No one noticed this incursion which showed how big the city was. The Nabateans won, however and killed most of the Greek army. The Greek leader was Anigones. Greeks wrote a letter to apologize. Nabateans paid 300 talens to the Greeks to show they still had Nabatean loyalty despite defeating the Greek army. 1 talen=6,000 drachmae so a lot of money. Basically the Nabateans bought peace from the Greeks. 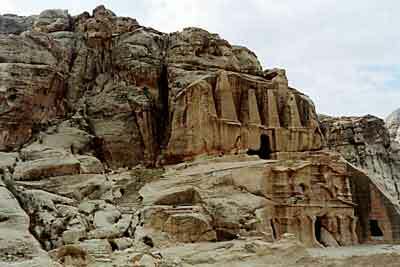 But the Greeks tried to take over the Nabateans a 2nd time but the Nabateans closed their gates. 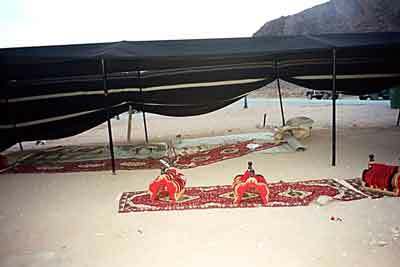 Then the Nabateans paid 600 Talens (a huge sum) + silk, cotton, perfume to try to get peace once & for all. Greek leader returned to his father to say, look, I won, I got a huge bribe. His father said, you are a foolish boy. By signing a treaty you are agreeing they are equal to us, the Greek empire! After that the Nabateans' fought against the southern part of Israel. 251 also quakes. But by 600-751 flouring city again. After 751 they moved the capital from Damascus to Baghdad. The so-called Treasury building was a local name; the building wasn't actually a treasury. It was tomb. Assyrian & Egyptian influence as well as Greek in the building and Rome. They borrowed from all civilizations. Unique carving style. Flatten curves of rock, then carve from top down. They wet the sandstone so it would not break during chiseling. No room for error in this carving. They carved the inside first to protect it from rain. There are actually 854 facades; the Treasury is only one. 8 meters higher ground than it was originally. The treasury was a king's burial place. Temple belief came from gifts to the dead. Note the Treasury was actually a King's tomb. Locals named it the Treasury presumably because they thought it looked like one. It is familiar to many Americans because of the movie Indiana Jones and the Last Crusade with Sean Connery & Harrison Ford that came out in the 1980-s.